Knowing what the best dog food is for your Siberian Husky comes down to understanding their roots. Huskies were originally bred to work in the Arctic wilderness pulling cargo-laden sleds over long distances. Their diet consisted of small amounts of heavily concentrated animal protein and fat - when it was available. 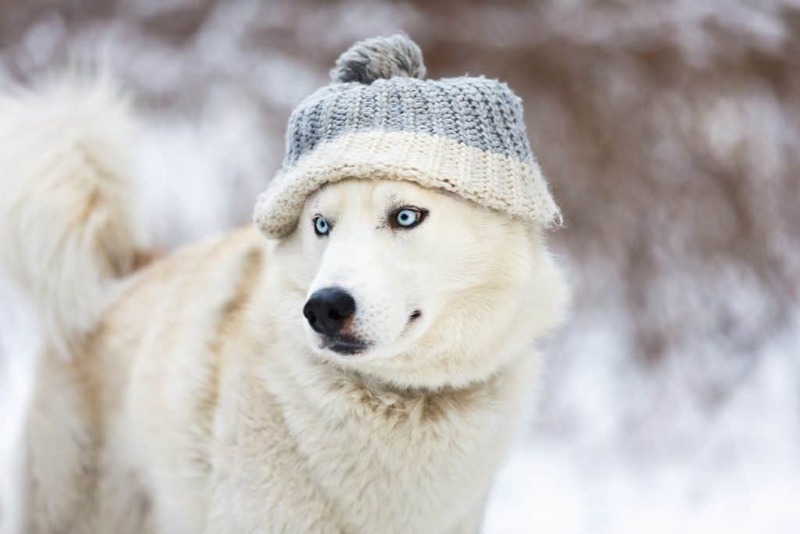 Huskies are, therefore, quite singular in the way their metabolism works as well as how much appetite they have, which affects the caloric amount they need to eat. How many calories does my Husky need? Huskies are medium-sized dogs with an athletic build (which isn't surprising - they are the athletes of the dog world! ), and they are usually high-energy. The max weight of the Siberian Husky is 50 lb, so this is the weight I have used to calculate how many calories your Husky needs. This number is likely to be lower for female Siberians, however, as they tend to weigh less than males. *These calculations are worked out using Dog Food Advisor. You should consult your veterinarian to get a better idea of the specific caloric needs of your dog. Bred for endurance and survival in freezing temperatures where food is scarce, Siberian Huskies have an efficient metabolism - a little food can last them a long time. This means that Huskies tend to eat small amounts of food for their size. While it depends on your dog’s activity levels, a typical Husky will eat 2 ½ cups of food a day. Many owners consider them "easy keepers" because of this. However, given that they eat less, they need energy-dense foods, which pack more calories into small amounts. This way, she will still be able to get her daily calorie intake. Higher quality dog foods usually offer food rich in calories (most high-calorie dog foods have between 400 - 500 calories or over per cup). While they do usually cost more, it is worth it to ensure your Husky's nutritional needs are met. So, in order to reach 1200 calories a day, if she eats 2 ½ cups a day, we need to find a dog food that contains about 480 calories a cup. The majority of Huskies are healthy, but they are susceptible to some serious health conditions, which are all hereditary. The main health problems concern her hips and her eyes. Corneal dystrophy: Non-inflammatory clouding of the cornea, or the outer surface of the eye. Usually, it occurs in both eyes, and in severe cases, the dog can become blind. Progressive renal atrophy: Disease of the retina that causes progressive loss of vision and eventually, blindness. Juvenile cataracts: Opacity that clouds or blocks vision, which usually starts before she’s 2 years old. Blueberries: contain carotenoids, phytonutrients, and flavonoids, which prevent muscular degeneration. Broccoli: contains beta-carotene, which protects the retina from free radical damage. Carrots: contain a wealth of nutrients, including Vitamin A and beta-carotene, which support eye health. Cold water fish like salmon and sardines: rich in Omega-3 fatty acids, which are important in the health of your dog's eye cells. Sweet potatoes: contains beta-carotene and anthocyanin, which contain antioxidant and anti-inflammatory properties. Kale: contains lutein and zeaxanthin. Hip dysplasia is a genetic disease that causes the head of the thighbone to fit poorly into the hip socket. 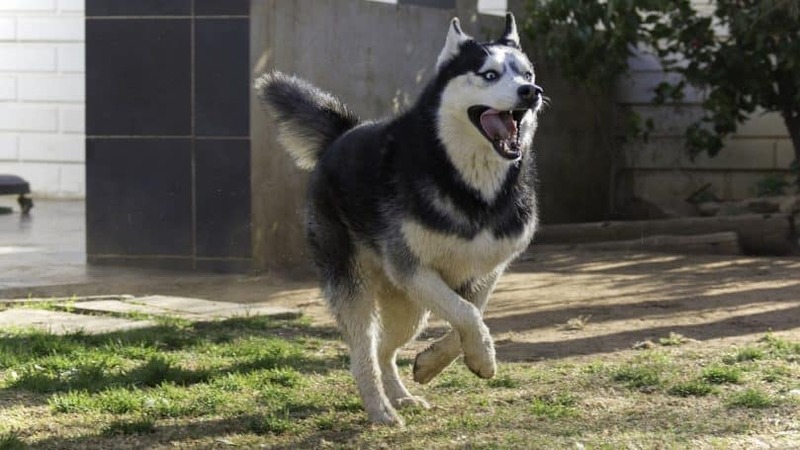 It is more commonly found in large breed dogs like German Shepherds, however, it can occur in Huskies, too. You can help your Husky by keeping her at a healthy weight*, as any extra weight puts strain on your dog's joints. You can also opt for dog foods that contain chondroitin and glucosamine, which are natural substances found in healthy cartilage. Chondroitin helps to neutralize destructive enzymes in the joint, while glucosamine is key in rebuilding damaged cartilage. Calcium is also important to support your Husky's bone and joint health. According to AAFCO, an adult dog should get a minimum of 0.5% in her daily diet. *A male Husky typically weighs between 45 - 60 lb (20 - 27 kg), while a female weighs 35 - 50 lb (16 - 23 kg). In a study conducted by Michigan State University, out of 140 dog breeds tested for hypothyroidism, Siberian Huskies ranked 27th. This condition causes low thyroid hormones, causing skin problems, weight gain and lethargy. It can be managed well with medication. Diet can also play an important role. Nutrients that can help this condition include iodine (found in fish, kelp and seaweed) and Omega-3s (found in fish oils). 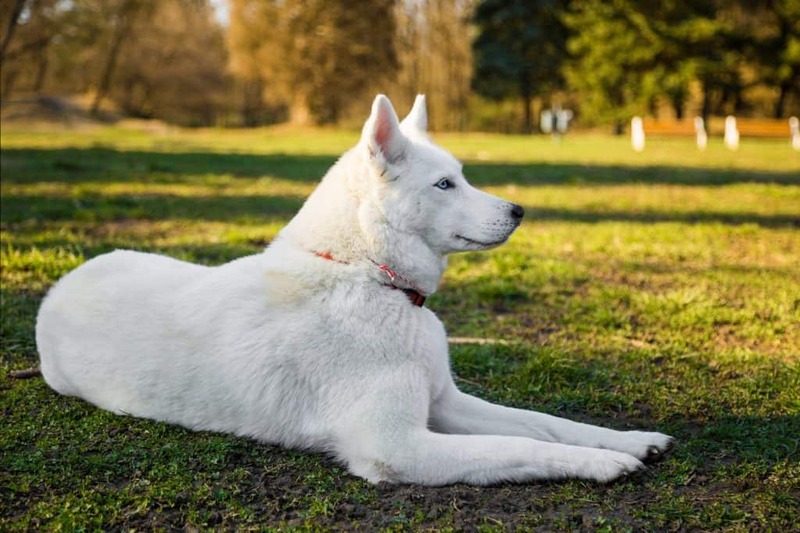 If your Husky suffers with thyroid problems, it is vital that she gets a diet rich in vitamins and minerals from a high-quality dog food that includes fruits and vegetables. This is because most dogs with this condition are lacking in the basic nutrients and minerals they need to stay healthy. According to Pet Education, 18% is the minimum protein requirement for an adult dog. Most good quality dog foods contain more than this (over 25%) to provide the best nutrition for your dog. As Huskies are highly energetic and consume a lot of calories quickly, they need a protein-rich diet and should receive between 25-35 % protein. Working Huskies will need at least 35% or more. Say 'no' to by-products and unspecified ingredients like 'meat meal' or 'animal meal,' as these are low-quality sources of protein. 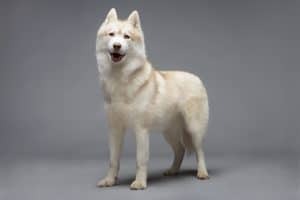 Since they have medium or long, thick coats, and burn a lot of energy quickly, I think that anywhere between 15 - 20% fat is suitable for a Husky. Dry dog foods usually contain about 16% fat. If she is a working dog (especially in cold temperatures), a higher-fat dog food (more than 20% fat) will be a good option, as she will need more fat to use as energy. Just as I advise with protein, make sure your Husky gets good sources of fat! Look for specific fats, like chicken fat. Fish oils and flaxseed are also very good sources because they also provide your dog with Omega-3 fatty acids for her skin and coat health. I believe that it is always better to choose a dog food that focuses on high protein and low carbohydrates, as dogs don't require a lot of carbs, and too many can cause stomach upsets and weight gain. I would still advise you to avoid common allergens like soy, corn, wheat and yeast, and opt for whole grains like brown rice and barley. As I outlined in the 'Health' section, the best dog food for Huskies should have plenty of vitamins, minerals, and antioxidants to support her thyroid function, eyesight, and immune system. The best way for your dog to get these nutrients is from dog foods that contain a variety of fruit and vegetables. Siberians may be better with grains than other breeds, but some owners say that Huskies find it difficult to digest lactose. It is probably to be safe than sorry and avoid dog foods with dairy products. That means no milk or cheese, and remember to look out for milk by-products, such as skim milk powder and whey powder. Finally, we are ready to show you our recommendations. We narrowed it down to 4 of what we think are good choices of high-quality dog food for Huskies. The Honest Kitchen is a brand that seems to be well-loved by its customers, many of whom claim that their dogs can't get enough of it! This brand prides themselves on their use of 'human-grade' dog food, which is free of chemicals, preservatives, and their meats are antibiotic and hormone free. Now that's what I like to hear! This recipe contains a good amount of protein for Huskies, at 31%, which is sourced from beef. They go on to throw in some fruits and vegetables, including sweet potatoes (great for her eye health), and flaxseed (providing Omega-3 for her thyroid and coat). There is also a source of thyroid-supporting iodine in the form of potassium iodide. The fat content is perfect for the typical Husky, at 16%. However, I wouldn't recommend this brand if your Husky is a very active or working dog, as she will use a lot of this fat as energy, and may not have enough to keep her skin and coat healthy. While it contains a good amount of Calcium at 1.1%, there are no additional ingredients for joint health. I, therefore, don't highly recommend this brand for Huskies with joint problems. Finally, it provides 514 calories a cup, which makes this a good food for Huskies who don't eat large amounts, as you'll only need to feed her 2 1/3 cups a day unless she requires more than the typical amount of calories. While I personally prefer Orijen´s nutritional, The Honest Kitchen is a good option if you are looking for a quality food at an affordable price. Orijen is a brand I recommend again and again. I love their high-quality, varied recipes, which use many ingredients that are fresh and local. This recipe contains an impressive 38% protein from a range of meats, including turkey, chicken, flounder, mackerel, herring, and sardine. The use of fish here gives your Husky a good dose of Omega-3 for her eyes and thyroid as well as skin and coat health. The fat content is just fine at 18%. As I said with The Honest Kitchen, if your dog is a very active or working dog, you should look at other brands that contain at least 20% fat. Another thing I like about Orijen is that they never fail in the nutrient department. They use a whole bunch of fruits and vegetables, which are all fresh. This recipe contains carrots, kale, and blueberries, which are great for her eye health, as well as kelp, which gives her a little kick of iodine to support her thyroid. So that's her thyroid, her eyes, and now for her hips. Orijen don't fail there either, as they add glucosamine and chondroitin into the mix to give her joints some help. To top it off, there is also a very good amount of Calcium (1.4%) to keep her bones and joints strong. I highly recommend this food for Huskies with hip problems. The only downside to this recipe is that it provides just a little under the calorie content I recommended for an average Husky who eats 2.5 cups a day, at 470 calories a cup. That means she would have to eat just a tad over 2.5 cups a day to get her daily intake, but the difference is just 0.05-cup. Another point I want to make is that Orijen is very costly, which is why it didn't make the #1 spot. If you can afford it, I think it's a great choice for your Husky. EVO is a brand that develops their formulas specifically for active dogs, using the ancestral diet approach. That means 82% meat, 18% fruit and veg and 0% grain. This recipe sources its protein from 5 meats, which are the first 5 ingredients. It's not surprising, then, that this dog food contains a highly substantial amount of protein, at a whopping 43.9%. The fat content is also high as 23.77%. This recipe is, therefore, ideal for very active or working Huskies. EVO also adds quite a few fruits and veg, including carrots to support your Husky's eye health. They also add eggs to the recipe, which we have seen help maintain healthy eye cells and protect against cataracts. There are plenty of added vitamins and minerals, too, including iodine and Omega-3 for her thyroid, and a high level of Calcium (2.6%) for her bones and joints. Though, unfortunately, there is no glucosamine or chondroitin for dogs with hip dysplasia. A letdown with this recipe is that they include cottage cheese. While cottage cheese is fairly low in lactose, it could cause an allergic reaction in some Huskies. This dog food provides the most calories of all four, at 516 calories per cup. To provide your Husky with 1,200 calories means feeding her 2.3 cups a day, so this food is perfect if your Husky doesn't eat large amounts. If she is a working dog and requires 1,700 calories, however, she will need about 3.5 cups a day. I chose Blue Buffalo Wilderness for its quality ingredients, as well as its tried and tested popularity. It has over 1,500 reviews on Amazon, of which 78% gave 5 stars. So apparently many dogs and owners alike are more than satisfied with it! It is also the most affordable of all four, so if you are on a budget but still looking for a quality dog food for your Husky, Blue Buffalo Wilderness is a good option. This recipe is rich in protein, at 34%, containing varied meat sources including deboned salmon, which gives her Omega-3s to keep her coat, eyes, and thyroid healthy. It is fairly low in fat, at 15%, so it is better for Huskies who are less active or a little overweight. Blue Buffalo Wilderness adds in a nice array of fruits and vegetables, including carrots, sweet potatoes, and blueberries, which support her eye health. They also include glucosamine in the recipe, but, unfortunately, do not go that bit further and add chondroitin. Therefore, it will help your dog´s joints somewhat, but not as much as Orijen´s recipe. The downside with this brand (which is why I had to rate it much lower than the rest) is that the calorie content is low for Huskies; it only has 410 calories a cup, so this is a food for Huskies who eat more. A typical Husky (weighing 53 lb) would need just under 3 cups a day of this food. My top recommendation for Huskies nutritionally is Orijen. However, it is very pricey, so if you are looking for a quality dog food that is more affordable, go with The Honest Kitchen. Blue Buffalo is also a great option if you are on a budget, but bear in mind that your Husky will need to eat 3 cups to get her daily calorie intake. EVO is another good choice (with a mid-range price), but it does contain ingredients which may cause an allergic reaction in some Huskies. What do you feed your Siberian Husky? Leave a comment below!